With captured Polish and Russian trains as templates the Germans went about creating a standard model of armored train in 1941. This was known as the BP42, and with later additions, the BP44. These new trains borrowed from the captured designs’ increased artillery capability over the existing German trains. They also overcame some of the perceived design flaws in the captured trains by splitting the artillery car in two, leaving only one gun on each car and thereby reducing loss of firepower if an artillery car was knocked out. Modern anti-aircraft guns and tank-hunter cars were also added making a formidable self-contained fighting unit. The key to the success of armored trains is their operational mobility. They can move rapidly to trouble spots and deliver effective support when they arrive. In a country with few modern roads, this is essential. The one part of the train that is truly critical is the locomotive. Without it, nothing moves! It was the locomotive that provided the power-plant to create this unstoppable behemoth. 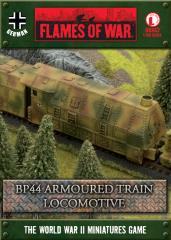 The BP44 Armored Train can also include the Tank Hunter Cars and of course needs some train track in order to move.